"When we got the call originally, we kind of didn't believe it. We needed some visual evidence, so we asked for a picture." A moving truck ended up in a Las Vegas swimming pool on Wednesday. 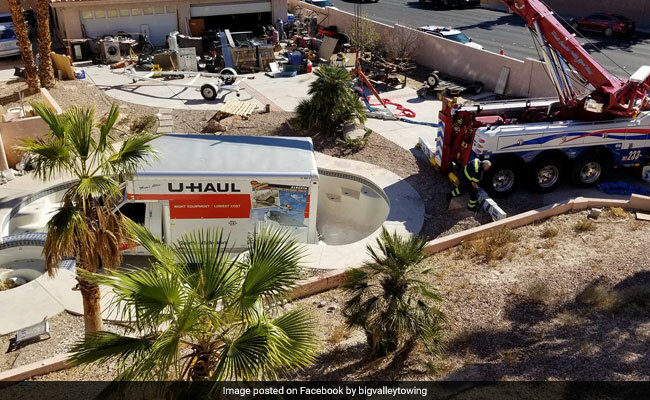 On Wednesday, police were called to a Las Vegas home to help remove a truck from an empty swimming pool. According to UPI, the Las Vegas Police Department said officers were dispatched about 8:50 am Wednesday on a request to "keep the peace" the Big Valley Towing worked on getting the moving truck out of the empty pool. "When we got the call originally, we kind of didn't believe it. We needed some visual evidence, so we asked for a picture. In fact, the truck was in the pool," said Jose Norena who was called to the scene as a Big Valley Towing employee. "You never realize what people do until you become a tow truck driver," he said to News 3LV. But how did the massive truck end up in a swimming pool? Well, according to a Facebook comment by Big Valley Towing, the driver's shoelace became stuck on the accelerator when he was pulling into the driveway and the truck ended up in the backyard pool. "The general story was they were trying to move the UHaul into the back yard and couldn't get it over the curb. When the person "hit the gas", his shoelace got stuck on the accelerator and it went into the pool," they wrote, sharing pictures and a video from the site of the accident. "All in a day's work. This is what we do day in and day out," said Mr Norena.